I'm a university student currently working on a disseration as part of my Geography degree. I'm trying to find ways to improve the presentation and overall quality of internet weather forecasts - making them more user specific and applying the forecasted weather conditions to where you'll be and what you'll be doing. As part of my background research, I'm just trying to get an insight into what you all think makes the perfect weather forecast for people who sail yachts and boats. If you could spare a couple of seconds quickly noting down ideas regarding the following points, I'd be really grateful! - What do YOU as a sailor require from an online weather website? - What are some of the problems you've encountered with them? - What changes would you suggest be made to them? - What would you like to see more /less of? The perfect forecast needs to be accurate. So a model which handles gradient, sea breeze and topographical effects. It also needs to be precise by in terms of time and location. However due to the nature of weather you would never achieve a perfect model... 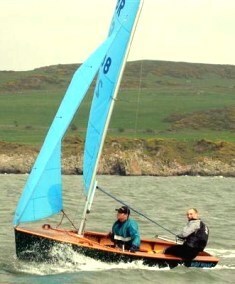 So you would be better producing a very good one for a small area (for example Weymouth in preparation for 2012). Thanks very much for that - I'll bear your comments in mind! Please keep the suggestions coming!! Sailors doing longer courses on the sea are very interested in changes in wind directions and strength, both in terms of location and timing. If you look at the custom forecasts prepared for race organisers and yacht owners wealthy enough to commission them, they have statements such as "along the coast, a gradient breeze of 3-4 knots and direction 150 will veer to 180 by 12:00 and 220 by 14:00, building to 12 knots. 10 miles offshore........etc. My experience of such forecasts is that they are rarely accurate! Have a look at Chimet on the HISC website. It give actual windspeed/direction, plus a graph of the last few hours. Don't think you can get a more useful local site. "I'm trying to find ways to improve the presentation and overall quality of internet weather forecasts"
Chimet and its sister sites are very interesting but they aren't forecasts. I like it because it gives weather a regular (3 hourly) intervals for the next seven days. It's great for offshore racing as it covers a whole sea area (we tend to race to Belgium/Holland/France from the UK) and it's good for inshore because on monday morning I can get a clue about next weekend and see how it develops during the week. One great bonus is that the site is simple enough to render well on a blackberry which is useful when away from a computer. And it's free! This is great because it's so local and the felixstowe data is smack where I do my racing most weekends. It's pretty accurate too with data for several parts of each day. I'd like it to be more long range of course but it's fine as it is. It's also free which is great. www.windguru.com is great if your area is there. As for a good site, it needs to be accurate and displayed in a clear method all can understand, no bar graph things. So - Sun - Wind Direction - Wind speed - Cloud cover etc are all required in a picture format.